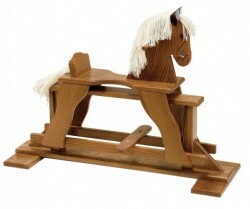 Old fashioned, but certainly not out dated, rocking horses remain a classic childhood toy. 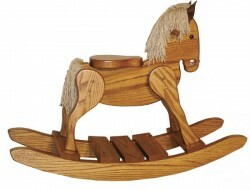 Perfect for the nursery or the playroom, a sturdy, handmade rocking horse is a beautiful, non-digital source of entertainment for the child in your life. Each rocking horse from Amish Originals is made-to-order—which means that you can customize your ride in all sorts of ways! Like our furniture, all of our rocking horses are made from responsibly harvested solid American hardwoods like Red Oak, Maple, Cherry or Quarter Sawn White Oak. 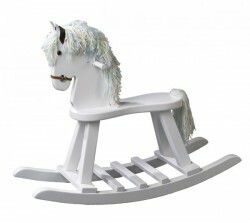 Every rocking horse can also be individualized for stain color, size, and style of base—even the mane color can be selected for the perfect look! In business since 1992, Amish Originals works with more than 70 families in Ohio’s beautiful Amish Country—our craftsmen have spent generations honing their time-tested skills. To learn more about our custom made rocking horses and our other children’s furniture, stop by our showroom in Westerville, Ohio’s historic Uptown shopping district. You can also call to learn more and request a quote for any item found on our website. Enjoyed today and for years to come, a rocking horse from Amish Originals will quickly become a cherished family heirloom.